Buying a home or applying for a HELOC can be both very exciting and intimidating. There are many questions that you may have about the application and approval process. Go to our resource center to answer all of the questions you may have and also to help you make the right decision on which option to choose from. Want a personalized quote? Create a customized quote based on your loan details. Apply for a first mortgage. Apply for a HELOC (home equity line of credit). No annual fee. No membership or participation fees. *APR = annual percentage rate. Actual rate based on creditworthiness. Members approved for Platinum Visa Credit Card will receive one of these rates. For vehicle, motorcycle, and boat purchases, whether new or used, our members have the advantage of loan rates as low as 2.5%*. We offer the same great rate for refinances as well. Your interest rate will be based on your credit score and your loan term. *Certain limitations may apply. A used vehicle may qualify for the collateral loan rate if it is no more than 7 model years back (2013 or newer) and less than 75,000 miles. Maximum term on collateral loans is 7 years. We may be able to offer a lower rate depending on certain member discounts. Contact us for more information. Payment example: For a $20,000 new auto loan for a term of 48 months with a 3.25% APR, the monthly payment will be $445. The credit union also offers car sale events and refinance promotions throughout the year. Feel free to apply in our office, over the phone, by mail/fax or apply online. The credit union offers great rates for personal loans! Unlike a credit card, a personal loan gives you the benefit of a fixed payment and fixed terms. Whether you’re looking to consolidate debt, pay off credit cards, finance your next big purchase, or whatever you may need, we offer a great rate! *APR = annual percentage rate. Rates are determined by credit rating and amount financed. You may also be eligible for additional rate discounts. Contact us for more information. Payment example: For a $1,000 new personal loan for a term of 24 months with a 6.95% APR, is a $45.00 monthly payment. Feel free to apply in our office, over the phone, have an application mailed/faxed to you or apply online. 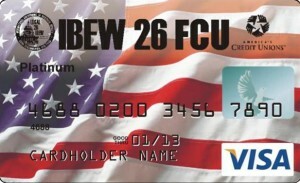 Protect your IBEW 26 FCU checking account and have extra cash for emergencies. Apply for your Overdraft Line of Credit today! A Share Secured Loan is a loan secured by the funds in your share savings account. Interest rates for a share secured loan are among the lowest we offer! No credit check required or lengthy credit analysis. Flexible financing options with a fixed rate of 3.05% APR* and terms as long as 120 months. Take advantage of the convenience of payments through payroll deduction and never be late! Payment example: $1,000 new share secured loan for 36 months with 3.05% APR* is $29.10 a monthly payment. The credit union offers a great loan product, the credit builder loan. The credit builder loan is a secured loan that helps you establish credit. It is available to all members of the credit union and does not go through a lengthy approval process. Feel free to apply in our office, have an application mailed/faxed to you or apply online. 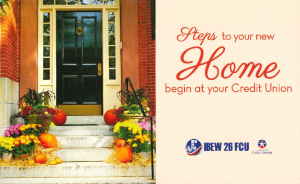 IBEW 26 FCU would like to offer our members that meet certain criteria (e.g. minimum six months on the job with a good work record, current union dues, and passing grades in school) a Tool Loan. It would be a $1,000 signature loan that must be set up to be paid by payroll deduction. A loan like this makes every new union employee want to join the credit union!